This exhibition tests the promise of an experimental treatment--emulation--for rescuing new media art from the ravages of time. Seeing Double features a series of original art installations paired with their emulated versions. This exhibition offers a unique opportunity for both art experts and the public to compare both versions directly and decide for themselves whether the re-creations capture the spirit of the originals. This exhibition is organized by the Solomon R. Guggenheim Museum in partnership with the Daniel Langlois Foundation for Art, Science, and Technology. This exhibition is generously supported by the Daniel Langlois Foundation. The preservation of contemporary artworks presents a challenge to museums like the Guggenheim, which are confronted with technological obsolescence, deterioration of materials, and varied installation requirements. One strategy for replicating ephemeral or obsolete media that is gathering interest is emulation. To emulate a work is to devise a way of imitating the original look of the piece by different means. The term can be applied generally to any refabrication of an artwork's components, as is the case with the refabrications and reconfigurations that are essential to the preservation of Conceptual, Minimal, and performative art. In the digital media realm, however, emulation has a specific definition. An emulator is a computer program that "fools" the original code into assuming that it is still running on its original equipment, thus enabling software from an out-of-date computer to run on a contemporary one. Seeing Double: Emulation in Theory and Practice pairs artworks in endangered mediums side by side with their re-created doubles--and sometimes triples--in newer mediums, offering visitors a unique opportunity to judge whether the emulated works capture the spirit of the originals. While making that judgment, bear in mind that emulation is, to paraphrase Oscar Wilde, rarely pure and never simple. Artists such as Cory Arcangel, jodi, and Robert Morris may choose emulation in combination with other preservation strategies, such as storing obsolete equipment or recording staged performances. When manipulation of hardware is critical to the artwork, as with the electronic sculptures by Nam June Paik or John F. Simon, Jr., emulation may not be as appropriate for the short term as migrating the original components to their up-to-date equivalents. And even in cases where emulation is the ideal solution, as in works by Mary Flanagan or Grahame Weinbren and Roberta Friedman, practical logistics and cultural factors may force artists to augment pure emulation with creative solutions of their own. These compromises do not refute the value of emulation for re-creating ephemeral artworks, but they do suggest that the intent of the artist may be a better guide than a one-size-fits-all technical solution. For this reason, the Variable Media Network-- a consortium of museums and archives cofounded by the Solomon R. Guggenheim Museum, New York, and The Daniel Langlois Foundation for Art, Science, and Technology, Montreal--is taking pains, through case studies such as these, to document how artists and their associates regard the long-term preservation of their work. ORIGINAL: Material, hardware, or software used in the first incarnation of the work. STORED: Material, hardware, or software that has been warehoused for future use as long as it remains viable. MIGRATED: Material, hardware, or software upgraded to its contemporary equivalent, often sacrificing the exact look or form of the original. EMULATED: Material or hardware rebuilt to imitate the impression conveyed by the original work, or software run in a special programming environment that imitates the original one. Cory Arcangel, I Shot Andy Warhol, 2002. 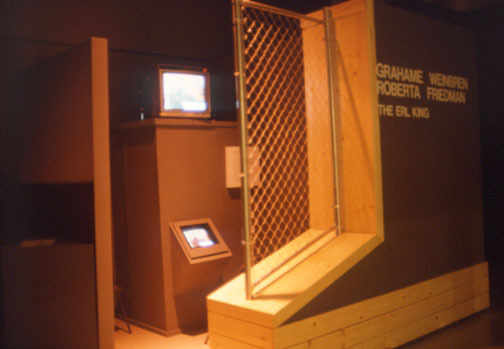 Installation view of Digital Media, American Museum of the Moving Image, New York, November 2002. Photo by Wendy Moger-Bross, courtesy American Museum of the Moving Image, New York. To hack the Nintendo game cartridge, Arcangel pried off the chip corresponding to the game graphics, rewrote its programming to include new game characters, and soldered it back onto the original cartridge. Arcangel left unchanged the chip that controlled the logic of the game itself, as well as the light gun used to interact with it. The impact of Arcangel's original intervention--hacking an obsolete game cartridge at the level of hardware-- would be lost in an emulated version. In the short term, storage of the original equipment--with potential migration of the television--is the ideal option for preserving this piece of technological nostalgia. When he told me that, I realized that you could change all the colors around and it wouldn't affect the gameplay, so I immediately had to make a light-gun game. The first part of the game is a typical shooting gallery. I left the machine code almost completely unchanged, but switched all the graphics on the chip. The characters are now the Pope, Flava Flav, and Colonel Sanders; you have to shoot the Warhols. For me the whole point of the work was the hardware intervention, the fact that I slaved over this ridiculous 6502 Nintendo language. If I hadn't been able to make a cartridge that ran the original code, I wouldn't have made the work. I tested everything in an emulator on a contemporary PC before I made the cartridge. It would have been next to impossible to write it without the emulator. In thirty years a laptop running that game is going to mean nothing to the public. 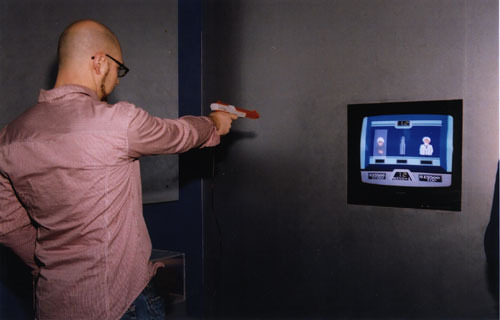 So I want I Shot Andy Warhol to be exhibited with a real light gun, the Nintendo, and preferably a period TV set. In fifty years if you searched the world over and there were no Nintendos, you could emulate it, but I wouldn't want a gallery to go out and spend $18,000 to rebuild light guns. I would want someone at home to be able to download and play around with the source code on his or her own emulator. Other people have already been porting my work to other versions. Somebody wrote me and was like, "Hey I got it to work on a Gameboy emulating the Nintendo," and I was like, "Cool." Because I also participate in behind-the-scenes emulation culture. Everything I learned about programming comes from homebrew culture, and it's important for me to give the code away so someone else could learn from it. 2004, Macromedia Director code, Windows 98 emulator on Macintosh OSX . Courtesy of the artist. Flanagan originally intended [phage] to be downloaded and run on individual users' hard drives. The version shown here mines data copied in 1998 from Flanagan's own hard drive, running on a PC under the Windows 98 operating system. To migrate the original [phage] program to a contemporary PC, Flanagan downloaded the program, installed it under Windows XP, and set it loose on data in her current hard drive. Although [phage] is compatible with this new configuration, the faster processor of the contemporary PC accelerates the tempo at which images and text snippets fly past the screen. Although [phage] cannot run on a Macintosh under normal circumstances, for this exhibition Flanagan installed a commercial Windows emulator, Virtual PC, on a contemporary Macintosh, which permitted her to download and run [phage] on an iMac. Ironically, because emulators often slow down processor speed, the pacing of the Macintosh emulation is closer to the original than the pacing of the Windows XP version. The [phage] program takes bits and pieces of data from a user's hard drive, mixing HTML with e-mail, Help files with business letters, a user's digital snapshots with banner ads and Internet detritus downloaded while browsing. The work blends the generally unquestioned categories of public and private embedded into the operating system's file hierarchies. In the way that an artist like Rachel Whiteread pays attention to the forgotten spaces of the physical world, so [phage] provides a feminist visualization of the systems that software engineers and hardware manufacturers have created for us to relate to our digital experiences. The project has been compared by users to the way we dream, or the workings of the unconscious. An acquaintance ran [phage] on a computer he had been using for a number of years. One of the snippets of text brought up in the mix of content from the hard drive was an email a friend sent him four years earlier, the last communication the two had had due to an argument. This person became very upset that the program could cull truly personal material and remind him of past events in his life he would rather have forgotten. The software runs on current Windows computers, but to test emulation as strategy for future re-creations, we ran [phage] on a Macintosh using a Windows emulator. The speed of the moving bits is a bit slow, but this makes the emulated version seem more meditative. This emulation process made me consider how the work migrates through machines. The key to the work is the content dredged by the program; showing the work in its "original" form would mean supplying content from that original era. I can see versioning the software so that content is preserved along with each version. New versions of the work could change to function with faster processors and grab larger pieces of content. The artist duo jodi based their JET SET WILLY Variations on a game from the 1980s created for the now obsolete ZX Spectrum computer. One version in this gallery displays the JET SET WILLY Variations on this antiquated equipment. The artists originally hoped that an existing emulator for the ZX Spectrum would enable them to reprogram the original Jet Set Willy code using a contemporary PC. However, since the emulator faithfully mimicked the input keystrokes of the ZX Spectrum, whereby each BASIC command has its own idiosyncratic key combination, it was nearly impossible to write code on a contemporary PC, whose keys are not marked with the commands corresponding to the Spectrum's unique keyboard configuration. To circumvent this problem, jodi used the Spectrum hardware emulator to access and change the byte code underlying the Jet Set Willy game, resulting in a version of the game with altered colors and sounds. By recording this hacked version on an audiocassette, jodi had the ability to port the game back onto the original Spectrum. Because the only keys required to play the game are the left arrow, right arrow, and space bar, the keyboard mismatch that impeded the artists from using the emulator to reprogram the game does not impede viewers from using the emulator to play it. The emulated game is seen here on a contemporary computer running Windows XP. Another of jodi's works for the vintage and emulated ZX Spectrum is 10 Programs Written in BASIC © 1984, which permits viewers to edit and run simple BASIC programs that paint black-and-white patterns on the screen. In a move reminiscent of Robert Morris's decision to film his live performances as documentation, jodi produced a video screen capture of someone interacting with 10 Programs on the vintage Spectrum. Although the resulting DVD All Wrongs Reversed © 1982 is not interactive, it can be stored or migrated in video format and mimics the visual properties of the Spectrum screen better than the emulated version running on a contemporary PC. Our new home in the Netherlands used to be a house in the 1980s, then turned into a kindergarten, and we are in the process of turning it back into a house. That's a bit like what we've done in our JET SET WILLY Variations, except that our house doesn't have sixty rooms like the Jet Set Willy game does. We started working with the Jet Set Willy game two years ago. We had no nostalgic feeling for the ZX Spectrum machine except from a retro point of view; in the '80s I did not have a computer and neither did Dirk. We were interested in old forgotten computer languages, and this was one of the first for home users. When we first played around with Jet Set Willy on a ZX emulator, it was hard to reprogram the code. On the vintage Spectrum, every key has four or five functions. To type a command like GOTO, you have to hit the right key combination; you can't just type G-O-T-O. On the PC keyboard it is very difficult to relocate these multiple short cuts. So instead of using the emulator to write the source code, we used the emulator to access the machine code. I modified the game's graphics and sound by poking through the Jet Set Willy program byte by byte. In the emulator you can play the game OK, because all you need is the left and right arrows, plus the spacebar to jump. But you don't get in contact with the original hardware. You have no idea that the game once ran off audiotape. 1993, restaged and filmed with Andrew Ludke and Sarah Tomlinson, directed by Babette Mangolte. 16-mm film transferred to video. Courtesy of the artist and Solomon R. Guggenheim Museum, New York. Morris was an active participant in the Judson Dance Theater, whose members explored the artistic potential of task-oriented movements. He choreographed and performed Site onstage in front of a live audience with artist Carolee Schneemann. Morris's restaging of Site three decades later aimed to emulate as closely as possible the look, age, and movements of the original dancers. Although it functions at a level removed from the live restaging, the film (transferred to video) represents a version of the work that can be stored and migrated rather than emulated. The impetus for making a film version of Site, a performance from 1964, originally came from Rosalind Krauss, who curated my 1994 Guggenheim retrospective. She thought it would be an interesting idea to have these performances shown along with other works from the same period. Unlike the staging of the original performance, the remake took hours and hours of rehearsing and waiting. The whole process of filmmaking is just so utterly boring--for me it was anyway. So the pleasure comes at the very end when you see it all together. I suppose we could have just restaged the performances, but somehow that did not happen; it was transmuted into a film instead. And the space of film is obviously very different than performance space. The same kinds of movements are going on, but your focus is extremely controlled by the filmmaker. Also, when I did the piece in '64, one sheet of plywood lasted for several performances, but we had to use a dozen sheets to get this film made. They make plywood in such a lousy way now, it doesn't have the same snap, it doesn't have the same look. Certainly, a great deal of this film, maybe the whole thing, is more about [director] Babette Mangolte than me, than Morris. But I've come to accept that. It has also become a record in perpetuity of that performance--the only one, other than my notes. So if anyone wanted to restage the performances, they would be able to consult the film. I don't think that I would do it, but someone might want to. TV Crown, 1965 (1988). Photo by David Heald. 1989, altered Samsung television with signal amplifiers. Solomon R. Guggenheim Museum, New York. Purchased with funds contributed by the International Director's Council and Executive Committee Members: Ann Ames, Edythe Broad, Henry Buhl, Elaine Terner Cooper, Dimitris Daskalopoulos, Harry David, Gail May Engelberg, Ronnie Heyman, Dakis Joannou, Cindy Johnson, Barbara Lane, Linda Macklowe, Peter Norton, Willem Peppler, Denise Rich, Simonetta Seragnoli, David Teiger, Ginny Williams, and Elliot K. Wolk, 2001. Paik first experimented with rewiring television sets in 1963 for his seminal exhibition Exposition of Music-- Electronic Television at Galerie Parnass in Wuppertal, Germany. 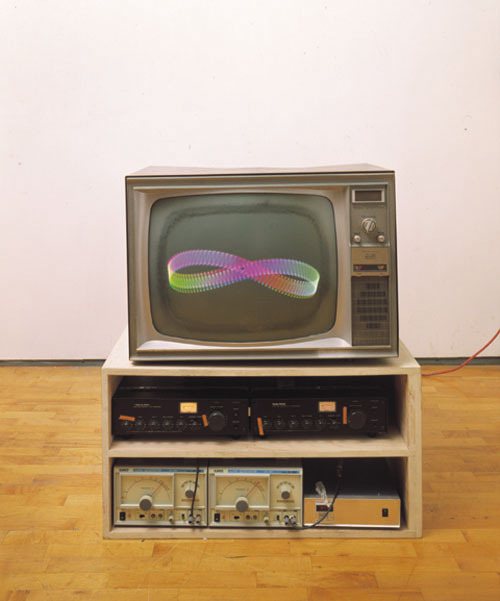 In 1965 Paik created another manipulated television, TV Crown, by adding a second electromagnetic "yoke" and feeding audio signals into both yokes to modulate the electron beam, thereby painting the screen with mesmerizing geometric oscillations. To re-create TV Crown for Paik's 2000 Guggenheim retrospective, the artist's long-time collaborator Jung Sung Lee performed the same manipulation with a contemporary television set to produce a result comparable to the original. This re-creation is more a migration to new hardware than an emulation of old hardware; however, if flat screens replace cathode-ray tubes in the future, the day will come when an off-theshelf TV set will no longer permit such manipulation. At that point, storing or custom-fabricating cathode-ray tubes ("hardware-for-hardware" emulation) would be the only option to preserve the work. but simply because it c h a n g e s.
completed work, (the pre-imaged ideal, or "IDEA" in the sense of Plato). usage of "IDEA" has not much to do with "TRUTH," "ETERNITY,"
Excerpts from "Afterlude to the Exposition of Experimental Television," The Fluxus Newspaper (New York), June 1964. Color Panel v1.0.1, 2004. C code, altered Apple PowerBook G3 laptop, and acrylic. Color Panel v1.0, 1999. C code, altered Apple PowerBook 280c laptop, and acrylic. Courtesy of the artist and Sandra Gering Gallery. Color Panel v1.0, 1999. C code, altered Apple PowerBook 280c laptop, and acrylic. Edition 1/2. Solomon R. Guggenheim Museum, New York. Purchased with fund contributed by the Young Collectors Council 99.5273. Color Panel v1.0, 1999. C code, altered Apple PowerBook 280c laptop, and acrylic. Collection of the artist. Courtesy of the artist and Sandra Gering Gallery. Color Panel v1.0.1, 2004. C code, altered Apple PowerBook G3 laptop, and acrylic. Re-creation by the artist. Courtesy of the artist and Sandra Gering Gallery. Simon created the original Color Panel v1.0 by stripping the casing off a 1994 Apple PowerBook 280c and embedding the screen in a white acrylic frame. His custom software, based on five interrelated cycles of moving blocks of color, runs on the PowerBook hard drive, which is embedded into the back of the frame. 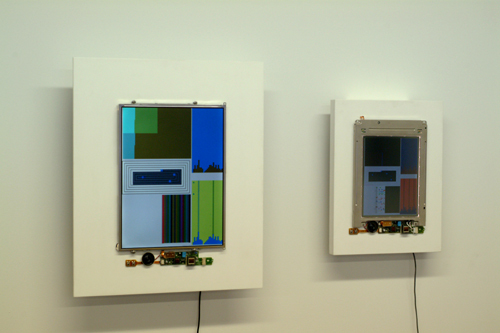 Since the program has entirely random elements, Simon and the variable media team decided to install another Color Panel v1.0 from the original edition to serve as a control for the experiment, so that viewers could distinguish discrepancies in color and imagery introduced by the new hardware from discrepancies already inherent in different sculptures from the original edition. For this exhibition Simon created Color Panel v1.0.1, an experimental version to test the possibility of running his custom software on newer hardware, in this case a 1998 Apple PowerBook G3. The original code ran too fast on the newer processor, however, so Simon introduced "waitstates" --commands to slow down the code--to reproduce the pacing of the original program more accurately. Technically, this alteration makes the recreation a migration rather than emulation, although most of the code is untouched in this preservation strategy. I was thinking about color contrasts in Josef Albers's Homage to the Square, a series of paintings with three or four nested squares, which depends on the relationship of the colors and what's surrounding what. In Color Panel v1.0, a digital sculpture made from an Apple 280c PowerBook, I wanted that kind of idea to work over time. Since these laptop components won't last forever, the first thing you'd want to do is exhaust all supplies of 280cs; you want any re-creation to be as close as possible. But at some point, we're not going to be able to get them. Then you have to make a decision whether you go to, say, a 14-inch LCD panel, or whether you're going to allow someone who owns the sculpture to refabricate the display. I wouldn't want a new version shown with the keyboard and everything; I'd expect the screen to be isolated. On the other hand, the reason the circuit board is in the original has as much to do with the way the 280c was designed as the fact that I like the way it looks. But that synthesis is hard to get all the time. Rather than trying to customize a screen to look like the original, my idea would be: What's available that, in some way, is in the same spirit? Maybe in the secondhand computer market, there's a screen with similar size that you can get to run for another fifty years. Maybe you'll have the possibility in fifty years to get an amazing organic LED, you know? The essential nature of the piece is the way the software runs. The code can live on all kinds of things. Emulations, it seems to me, just keep adding shells and shells of programming over time. I just think that's too much overhead, and then it's not efficient. If you go to the source code and recompile it, you're closer to the machine. You can control more things at more levels. It doesn't bother me if variations start to occur among the numbered editions of this piece because different ones get upgraded at different times. A Color Panel with the version number 1.5 would indicate a feature change, but if the re-creation was a direct port--same features, same speed, same color depth--the version would be something like Color Panel 1.0.1. Code by its nature modifies and propagates. 1982-85, PASCAL code, SMC-70 computer, storage cp/m operating system, custom-built video switcher, three laser disc players, Carroll touch screen, one CRT viewing monitor, one CRT touch-screen monitor, and three laser discs. 2004, JAVA code, PASCAL code, Sony Desktop computer (specs to come), Linux operating system, viewing monitor, touch-screen monitor, and Elo touch screen. Courtesy of the artist, promised gift to Solomon R. Guggenheim Museum, New York. Specific features of the Sony SMC-70 computer contributed to what artists like Weinbren and Friedman could achieve in the emerging medium of interactive cinema. The computer takes input from the infrared bezel touch screen and signals the laser disc players to find and play video and audio segments. The RGB overlay system enables text and simple graphics to appear on the input screen but not the public viewing screen. To control these various components and present a seamless interactive narrative, the artists and their collaborators wrote a custom PASCAL program, loaded at runtime into the computer's cache disk, that provides potential pathways through the video. Due to its unique syntax and complexity, this code merits historical interest beyond its function in The Erl King; indeed, Weinbren and Friedman intended to share the program with other artists to help them create their own interactive video installations. The artists worked together with the Guggenheim's variable media team and consultant Jeff Rothenberg to digitize the video and audio, and software engineer Isaac Dimitrovsky programmed a new interpreter for the original PASCAL code. When the PASCAL code sends a command to load audio, video, text, or graphics files from their original storage devices, the interpreter emulates the function of the video switcher, the graphics cache, and the laser disc players to ensure that video and sound clips play at the right times. This re-creation is not emulation in the deepest sense, for the interpreter mimics only the PASCAL program's calls to hardware peripherals, and not the entire computer on which it runs. Nevertheless, the old code still calls the shots--quite literally--while the new code replaces obsolete hardware so that The Erl King can function in its intended way. Roberta Friedman and I began The Erl King in 1982. The idea was that it would be seamless and cinematic, and that the viewer could interrupt the flow at any moment. It was based on a connection, pointed out to me by film scholar Noll Brinckmann, between two famous nineteenth-century texts, Goethe's "Erlkönig" and one of the dreams analyzed by Sigmund Freud. One thing often overlooked about Freud is his gift for visualization. His descriptions of dreams often create precise, memorable images. An example is the dream of the burning child. A sleeping father dreams that his dead child taps him on the shoulder and whispers, "Father, don't you see I'm burning?" He wakes up and runs into the next room to find his child's body in flames. This intense, cinematic moment haunted me for years. Goethe's "Erlkönig" is another father and son story. They are riding together "through the night and the wind" and a supernatural creature keeps appearing and urges the child to leave his father and join him. When the boy asks his dad for confirmation-- "Father, don't you see the Erl King?" (a counterpart to the burning child's plea)--the father refuses to acknowledge the reality of his son's fear. The way these texts echoed in the deepest regions of my own psychology prompted me to begin to imagine a film with the two elements at its base. I became aware of the possibility of combining interactivity with the moving image in 1981, and Roberta and I reconceived the project as a work of interactive cinema. We started by shooting a performance of the Schubert arrangement of "Erlkönig" set among palm tress and caged live chickens, and an enactment of the burning child scenario set in Anna Freud's bedroom. Then we picked up elements of these scenes and made them into repeating motifs. Interactivity makes it possible to forge any number of connections. By pointing at the screen, you glide from Schubert to gospel music to improvised trombone to New Wave performance, from Sigmund Freud to Jacques Lacan, from stock car racing to abandoned, wrecked cars decorated with lines from Goethe, from a chicken-plucking machine to a Chinese chef to chickens dyed red, green, and blue. The breakthrough technology of the laser disc is that it allows the sequencing of images to be determined at the time of presentation, rather than fixed during the production process as would be the case with a film or videotape. This in turn means that a system can be set up so that the viewer can determine the sequence. In this way it is random access, not digital technology, that animates and releases the Erl King. Most of the equipment that runs The Erl King is now twenty years out of date. If the piece is to last into the future, it will have to lose its dependence on dinosaur machinery (and today's hot devices are always the dinosaurs of tomorrow). In some cases the apparatus that runs a piece is an indispensable part of the work, but for The Erl King it is irrelevant. The apparatus is no more than what makes the interactivity possible, so a digital version of the piece, whatever equipment it runs on, will be exactly the same piece. But it is necessary that the computer code and video precisely match the original, and for that reason we decided to write a computer program that interprets the original computer program for a contemporary computer environment. All hardware is emulated, i.e., the video players and the switcher are now digital devices, parts of a computer program. Thus, The Erl King has been transformed from analog to digital. The symposium is free with the purchase of museum admission.